If I had to pick one author from all the books I have read on chess, then without a doubt I would choose CJS Purdy. It is a great regret of mine that I only came across his writings within the last ten years (I don't remember precisely why or when) and in particular that I did not know of his material as a teenager, when my thirst for chess knowledge, and rate of learning, was at its highest. I whole heartedly recommend his books to aspiring players. His book The Search for Chess Perfection II (I have the Thinkers' Press, 2006 edition) is one of the books I have learnt most from. I like both his style of writing (quirky, old fashioned, but warm) and what he says. In any position that you are considering, present or future, look around for all possible checks (however absurd-looking); also all checks-and above all, mates-that would be possible if every piece could jump over anything in its way and could not be captured. Imagine the threat could not possibly be executed. Then what would be by best move? Try out each attractive move…visualise the whole position…after this move of yours, and then work out whether the opponent would gain by executing his 'threat'. 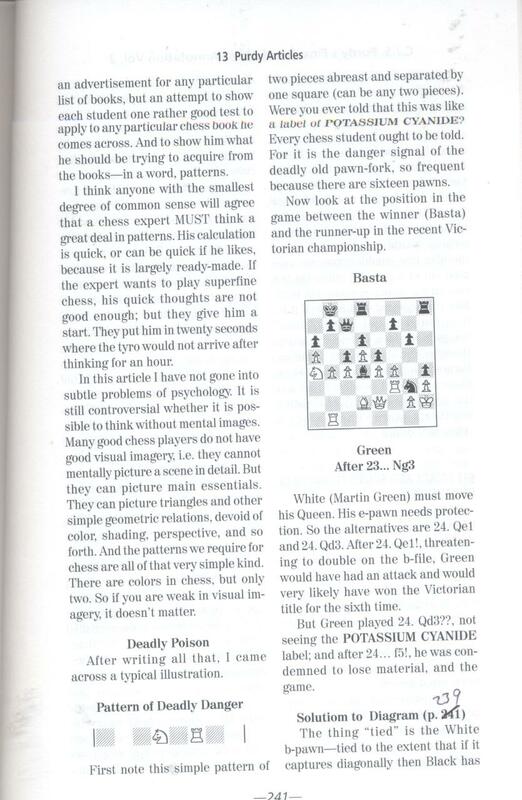 In one of my favourite of his books, CJS Purdy's Fine Art of Chess Annotation and Other Thoughts, Volume Two, he talks about patterns and imagery in a way which, when I first read it, was a revelation. It made me LOL (to use modern language) but the point he makes is profound. Whenever I manage to fork pieces in the way he describes, I give a nod and a smile to him, for teaching me Potassium Cyanide. Wow.. his book is over 100$ on Amazon! Must be very good . Is his style of writing similar Jeremy Silman’s? In a sense, yes: in that like Silman, Purdy tries to connect with the reader. I haven’t checked, but I think there could be different editions of his ‘Search’ book available. However, his ‘Annotations’ series would be a good introduction to see if you like his writing style. I would recommend buying Annotations II first, for its appendices.